Paralysis of one side of the body due to Pyramidal Tract lesion at any point from its origin in the cerebral cortex down to the fifth Cervical segment ( beginning of origin of cervical plexus ) . Vascular - Cerebral hemorrhage , Stroke , Diabetic Neuropathy. Infective - Encephalitis , Meningitis , Brain abscess. Demylination - Disseminated sclerosis , lesions to the Internal capsule . Traumatic - Cerebral lacerations , Subdural Hematoma . Rare cause of hemiplegia is due to local anaesthsia injections given intra arterially rapidly , instead of given in a nerve branch . Psychological - Parasomnia (Nocturnal hemiplegia ). Damage to the CorticospinalTract leads to the injury on the oppoSite side of the body. This happens because the motor fibres of the CorticospinalTract , which take origin from the motor cortex in brain , cross to the oppoSite side in the lower part of medulla oblongata and then descend down in spinal cord to supply their respective muscles. Depending on the Site of lesion in brain , the severity of hemiplegia varies. An accurate history profiling the timing of neurological events is obtained from the patient or from family members in the case of the unconscious or noncommunicative patient . Of particular importance are the exact time and pattern of symptom occurs . The most common , slowest in hours , wakes up in the morning with weakness , history of TIA , old age is typical with thrombosis . An embolus occurs rapidly with no warning , history of heart disease , younger age group , no progression (maximum deficit occurs at onset) . An abrupt onset with worsening symptoms , history of prolonged hypertension , severe headache described as "worst headache of my life " , altered consciousness , convulsions , vomiting is suggestive of haemorrhage. The patient 's past history , including episodes of TIAs or head trauma , presence of major or minor risk factors and medications , pertinent family history and recent alterations in patient function ( either transient or permanent ) are thoroughly investigated. The physical examination of the patient includes an investigation of vital signs ( heart rate , respiratory rate , blood pressure , clubbing ) , signs of cardiac decompensation, and function of the cerebral hemispheres , cerebellum , cranial nerves , eyes and sensorimotor system. CRS-R Coma Recovery Scale Revised is used to assess patients with a disorder of consciousness, commonly coma. CerebroVascular imaging is the main tool to establish the diagnosis of suspected hemiplegia. Advanced neuroimaging can rapidly indentify the occluded artery and estimate the size of the core and the penumbra. For acute care of stroke patients, a number of computed tomography (CT) and magnetic resonance (MR) techniques are essential. Noncontrast CT excludes other causes of acute neurologic defi cits and intracranial hemorrhage. CT and MR angiography can identify intraVascular clots, and the CT angiography source images improve detection of acute infarction over plain CT. Diffusion MRI estimates the size, location, and age of infarcted core more precisely, and perfusion imaging estimates the ischemic penumbra.CT and MR imaging techniques are used to provide four types of information that are essential to the care of acute stroke patients. 1. They establish the diagnosis of ischemic stroke and exclude other potential causes of an acute neurologic defi cit. 2. They identify intracranial hemorrhage. 3. They identify the Vascular lesion responsible for the ischemic event. 4. They provide additional characterization of brain tissue that may guide stroke therapy by determining the viability of different regions of the brain and distinguishing between irreversibly infarcted tissue and potentially salvageable tissue. • blood test to examine the presence of hypercholesterolemia (high cholesterol). The selection of examination procedures will vary based on a number of factors including patient age , location and severity of stroke , stage of recovery , data from initial screenings , phase of rehabilitation and home /community / work situation , as well as other factors. Vital signs - Level of consciousness ,pulse , BP , look for pupil size , conjugate deviations of eyes , Meningeal signs. Sturge Weber Syndrome - facial nerve (port wine stain ) involving one half of face with upper eyelid - associated with atrophy and calcification of ipsilateral cerebral hemisphere. B. Orientation -In time , place , space , person are tested. F. Emotion - Anxious / depressed / elated / swings of mood. In hemiparesis, facial paresis may not be obvious. In mild cases, subtle features of facial paralysis (eg, flattening of the nasolabial fold on 1 side compared to the other, mild asymmetry of the palpebral fissures or of the face as the patient smiles) may be sought. The shoulder is adducted; the elbow is flexed; the forearm is pronated, and the wrist and fingers are flexed. In the lower extremities, the only indication of paresis may be that the ball of the patient's shoe may be worn more on the affected side. In severe cases, the hand may be clenched; the knee is held in extension and the ankle is plantar flexed, making the paralyzed leg functionally longer than the other. The patient therefore has to circumduct the affected leg to ambulate. The therapist examines for facial sensation (CN 5) , facial movements (CN 5 and 7), and labrynthine / auditory function (CN 8 ) . The presence of swallowing and drooling necessitates an examination of the motor nuclei of the lower brainstem cranial nerves (CN 9 , 10 and 12) affecting the muscles of the face , tongue , pharynx and larynx. The visual system should be carefully investigated , including tests for visual field defects (CN 2 , optic radiation , visual cortex ), acuity (CN 2 ) ,Pupillary reflexes (CN 2 and 3 ) and extraocular movements (CN 3 , 4 and 6). Sensory integration is the ability of the brain to organise , interpret , and use sensory information . Examination of sensory function involves testing patient's ability to interpret and discriminate among incoming sensory information. An examination of joint flexibility should include passive ROM using a goniometer , joint hypermobility/hypomobility , and soft tissue changes (swelling ,inflammation or restriction). The shoulder and wrist should be examined closely because joint malalignment problems are common. Edema of the wrist often produces malaligned carpal bones with resulting impingement during wrist extension. Active ROM may be limited or impossible for the patient in early or middle recovery in the presence of paresis , spasticity , or obligatory synergies that can preclude isolated voluntary movements. Contractures can develop anywhere but are particular apparent in the paretic limbs. As contractures progress , edema and pain may develop and further restrict mobility . In the UE ,limitations in the shoulder motion of flexion , abduction and external rotation are common. Contractures are likely in the elbow and finger flexors , and forearm pronators. In the LE , plantarflexion contractures are common. An examination of tone is essential . Passive motion testing can be done to determine the presence of hypertonicity or spasticity. Severity of spasticity can be graded on the basis of resistance to passive stretch using the Modified Asthworth Scale. The limb on the paralysed side are more flaccid and drop passively. The cheek on the paralysed side moves in and out with respiration. 1.Paralysis of one side of the body . This paralysis shows a pyramidal distribution . It affects the progravity more than the antigravity muscles as the former are normally weaker than the latter. In upper limb , the extensors are weaker than the flexors. In lower limb, the flexors are weaker than the extensors. It affects the distal more than the proximal muscles. The hand is weaker than the shoulders. In upper limb, the flexors are more spastic than the extensors. In lower limb , the extensors are more spastic than the flexors. Reflexes are altered and also vary according to the stage of recovery . Initially , stroke result in hyporeflexia with flaccidity . When spasticity and synergy emerges , hyperreflexia is seen . Deep tendon reflexes are hyperactive and patient may demonstrate clonus , claspknife response and positive Babinski , all consistent finding of upper motor neuron Syndrome.There are certain pathological reflexes looked for in hemiplegia . In upper limb clinically significant - if markedly active and asymmetrical are Hoffmann's sign , Wartenberg's sign . Superficial reflexes in hemiplegia are loss of Abdominal reflex and cremastric reflex which is a sign of UMN Lesion . Abnormal and highly stereotyped obligatory synergies emerge with spasticity following stroke . Thus the patient is unable to perform an isolated movements of a single limb segment without producing movements in the remainder of the limb. Two distinct abnormal synergy patterns have been described for each extremity : flexion and extension synergy. An inspection of synergy components reveals that certain muscles are not involved in either synergies . These muscles include the 1. latissimus dorsi 2. teres major 3. serratus anterior 4. finger extensors and 5. ankle evertors. These muscles are therefore generally difficult to activate while the patient are exhibiting these patterns. Proprioceptive loses can result in sensory ataxia . Strokes affecting the cerebellum typically produce cerebellar ataxia and motor weakness. The resulting problem with timing and sequencing of muscles can significantly impair function and limit adaptability to changing task and environmental demands. The therapist focuses on elements of speed / rate control , steadiness , response orientation , and reaction and movement times.Fine motor control and dexterity should be examined using writing , dressing and feeding tasks . Treatment of the adult with Hemiplegia, following stroke starts from the very acute stage, when the patient in the ICU or Hospital bed. Treatment should be based on assessment by the relevant health professionals, including physiotherapists, Physicians and occupational therapists. Muscles with severe motor impairment including weakness need these therapists to assist them with specific exercises. Frequent changes of the patient's position (every 2 hours) and of the bed sheets. Frequent wash of the skin of the back and pressure points by alcohol followed by talc powder. Suction of nasal and pharyngeal secretions. Oxygen inhalation via catheter or mask specially in cases of coma. Tube feeding giving fruit juices , milk and pureed food , besides I.V. Fluids , in comatosed patients. Foley's self retaining catheter in case of retention or incontinence. Urinary antiseptics : Gentamycin 80 mg I.M . every 12 hours. Care of bowels : Daily enema. Once the patient’s condition is stable he is made to move out of the hospital bed and attends the Rehabilitation therapy clinic of the concerned Hospital or is referred to such clinics outside..
Stroke rehabilitation begins almost immediately, preferably within 24-36 hours once a patient is found medically stable. The Physiotherapist focuses on joint range of motion and strength by performing exercises and re-learning functional tasks such as bed mobility, transferring, walking and other gross motor functions. Physiotherapists can also work with patients to improve awareness and use of the hemiplegic side. Rehabilitation involves working on the ability to produce strong movements or the ability to perform tasks using normal patterns. Emphasis is often concentrated on functional tasks and patient’s goals. One example physiotherapists employ to promote motor learning involves constraint-induced movement therapy. Through continuous practice the patient relearns to use and adapt the hemiplegic limb during functional activities to create lasting permanent changes. Activities in posture : holding , weight shifting , UE reaching , LE lifts , assumption of posture , locomotion on all fours. The overall duration of the session will be one hour. The total duration of the aerobic/cardiac exercise training should increase from 15 minutes (week one) to 40 minutes by week 12. The intensity of exercise should aim to be moderate as opposed to low. This effort level is required for all components but will be adjusted for each individual according to health status on a session-by-session basis. The frequency of the session should be three times per week wherever possible. FES is a modality that applied a short burst of electrical current to the hemiplegic muscle or nerve. In Hemiplegia Physical Therapy, FES has been demonstrated to be beneficial to restore motor control, spasticity, and reduction of hemiplegic shoulder pain and subluxation. It is concluded that FES can enhance the upper extremity motor recovery of acute stroke patient. FES could reduce spasticity in stroke patient. A recent meta- analysis of randomized controlled trial study showed that FES improves motor strength. FES can significantly improve arm function, electromygraphic activity of posterior deltoid, range of motion and reduction of severity of subluxation and pain of hemiplegic shoulder. Biofeedback is a modality that facilitates the cognizant of electromyographic activity in selected muscle or awareness of joint position sense via visual or auditory cues. In Hemiplegia Physical Therapy the result of studies in biofeedback is controversial. A meta-analysis of 8 randomized controlled trials of biofeedback therapy demonstrated that electromyographic biofeedback could improve motor function in hemiplegic patient. Another meta-analysis study on EMG has showed that EMG biofeedbcak is superior to conventional therapy alone for improving ankle dorsiflexion muscle strengthbshowed that biofeedback could improve earlier postural control to improve impaired sitting balance. Circuit training (reaching in sitting and standing, sit-to-stand, step-ups, heel lifts, isokinetic strengthening, walking over obstacles, up and down slopes). Traditional approaches to stroke recovery have a focus on neuro facilitation or neuro developmental techniques (NDT) to inhibit excessive tone, stimulate muscle activity if hypotonia is present and to facilitate normal movement patterns through hands-on techniques. Practice based on the framework advocated by Berta Bobath remains the predominant physical therapy approach to stroke patients in the UK and is also common in many other parts of the world, including Canada, United States, Europe, Australia, Hong Kong and Taiwan. The Bobath framework has evolved from its original foundations, however, therapists surveyed on the core Bobath elements still emphasize normal tone and the necessity of normal movement patterns to perform functional tasks. Strength training to improve walking ability Task-specific training to improve walking ability. ↑ 3.0 3.1 3.2 3.3 3.4 3.5 O’ Sullivan SB, Schmitz TJ. 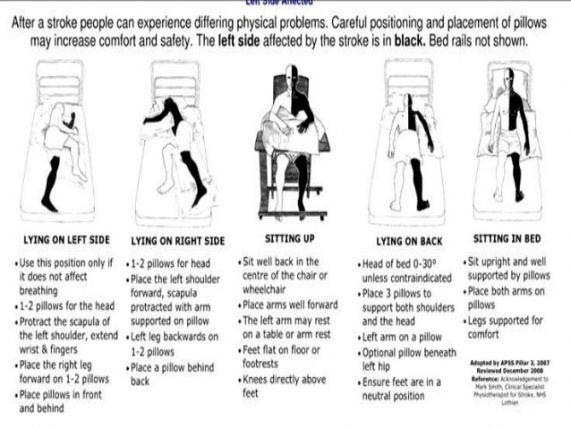 Stroke.Physical rehabilitation. 5th ed., NewDelhi: Jaypee Brothers, 2007. ↑ Boulter DJ, Mukundan G, Schaefer PW. Neuroimaging of Acute Stroke. Stroke Recovery and Rehabilitation. 2014 Sep 18. ↑ Oommen, Kalarickal J. "Neurological history and physical examination." (2013). ↑ O'Sullivan SB, Schmitz TJ. Improving functional outcomes in physical rehabilitation. FA Davis; 2016 Feb 17.